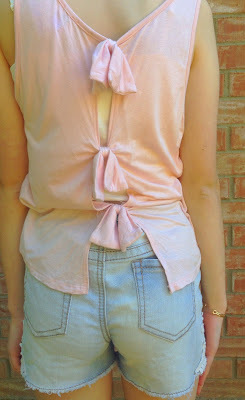 If you didn't know, I have a low key obsession with bows, and this top is one of my favorites to wear in the spring. I love to pair it with a big statement necklace, but I also really like to keep it simple like I did here. The bows on the back add such a fun detail and I'm obsessed! I scored these shorts from Target last summer, and they're the cutest thing ever! They're actually kids' shorts (life hack: if you're a 00 or 0 in bottoms, Target actually has cute girls' shorts that are really cheap) but you can find similar ones in lots of places. If you want to see how Rebecca styled this color, go check out her post here! What are your thoughts on Rose Quartz?